Hey, Peter, what happened this time??! I thought I had the corner on falls (last Oct. broke my wrist – it wasn\’t healing right-had to operate.Took a year to really be with my flute again…then fell backwards from a chair a fractured my tailbone…very painful but healing was quicker.) I read your title \”through a windshield\” and thought that\’s what happened to you! 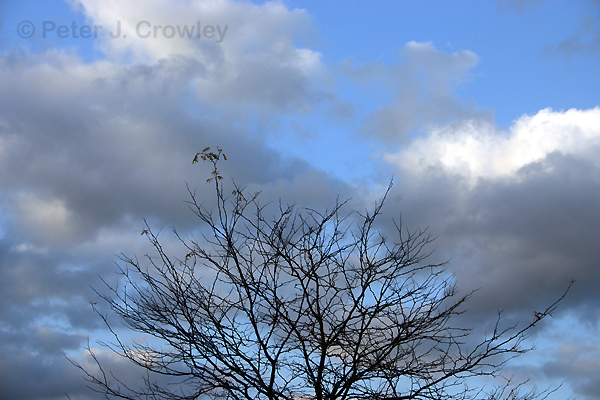 Love the orchid and the almost leafless tree with sky…. I didn\’t drive for a year including the four month hospital visit or walk much the till early winter. I had heard about your wrist last time we talked but don\’t remember the second fall.